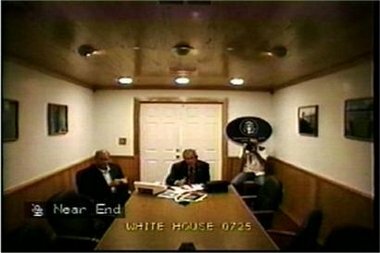 Video footage taken just hours before Hurricane Katrina battered the Gulf Coast shows that federal officials delivered stark warnings to President Bush and Homeland Security Secretary Michael Chertoff that the storm could lead to massive loss of life. “We are fully prepared,” Bush responded. In the event, the president’s response was slow and sluggish in the wake of Hurricane Katrina. “Bush was, and is, a so-called “binge drinker.” This means that from time to time, often when under pressure, he goes to Crawford for privacy and during his visit, gets royally drunk. During this time, it has been proven impossible to communicate anything to Bush, and his aides and his wife not only shield him from hostile eyes but endeavor to fill in until he is back amongst the living again. In this case, the White House staff in Washington, horrified by the mounting news stories and well aware of the President’s chronic drinking problems, compiled a DVD containing urgent television programs on the progress of the disaster and sent it by courier to Crawford to play for the President. Three days after the levee collapse and the mounting chaos in New Orleans, Bush apparently regained some degree of sobriety and then decided to leave Crawford…for a fund-raising dinner in Arizona and a photo opportunity in California!.